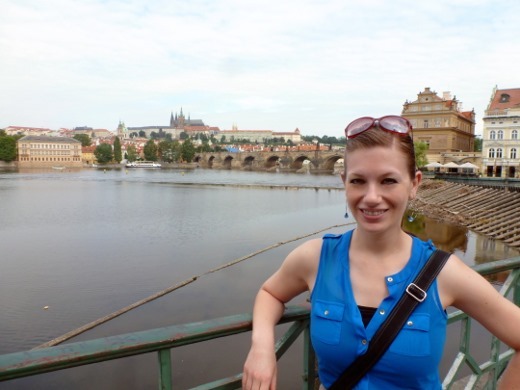 Last week, the huz and I returned from our vacation in Prague and I am here to tell you more about our time in the Czech Republic! If you missed the post recapping our day of arrival, you can read it here. 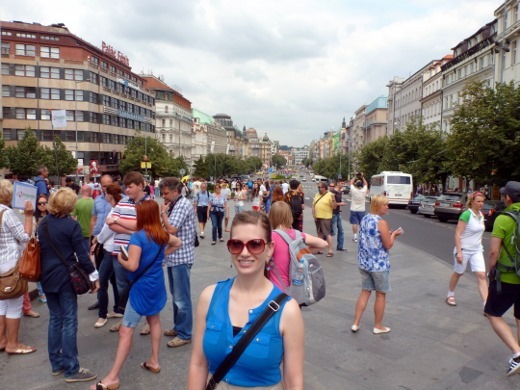 Today, I am here to tell you about our first full day in Prague. We awoke to warm weather and overcast skies. Eventually, the clouds cleared and the sun came out in the afternoon. Had I known how much pure, intense sun we would be receiving for the rest of our trip, I would have relished these few hours of walking without the hot sun beating down (burning my feet just walking around – a little Phil Collins, anyone?). 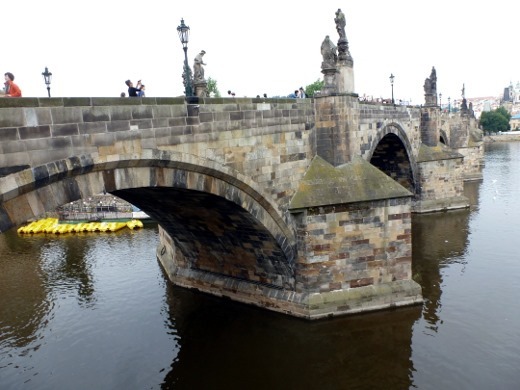 The bridge was built in the 14th and 15th centuries and is considered an architectural marvel. Endless sources have recommended visiting the bridge early in the morning or late at night to escape the endless mass of tourists, but we never managed to do so. So, here is the bridge in it’s full glory, by day, filled with pedestrians, tourists, vendors, and the like. 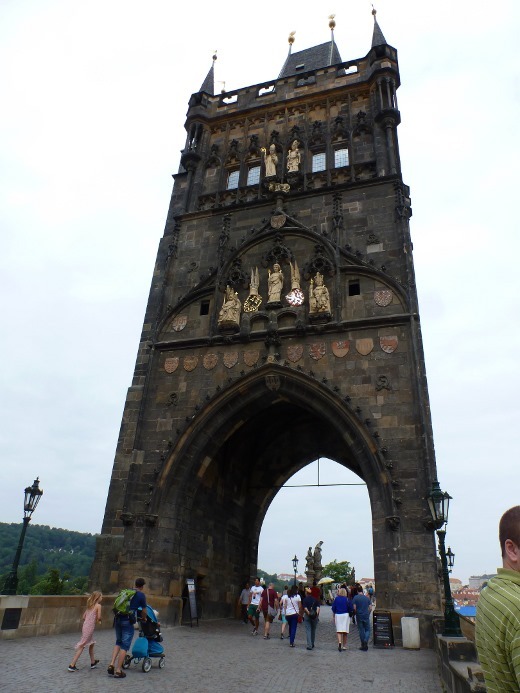 The bridge affords spectacular views of Prague, such as this view of the Prague Castle. On our first full day, we didn’t actually fully cross the bridge, just walked halfway across and came back. 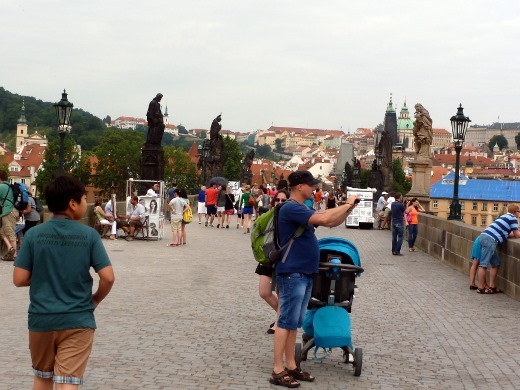 Next, we moseyed down the Smetana embankment, the sidewalk that leads one down the river, for even more amazing views of the Charles Bridge and Prague Castle. View of the Vltava River, Charles Bridge, and Prague Castle. Oh, and of me. 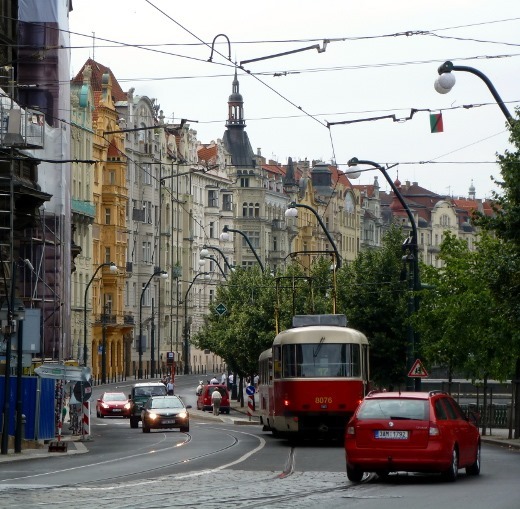 The trams are constantly zooming through the city. 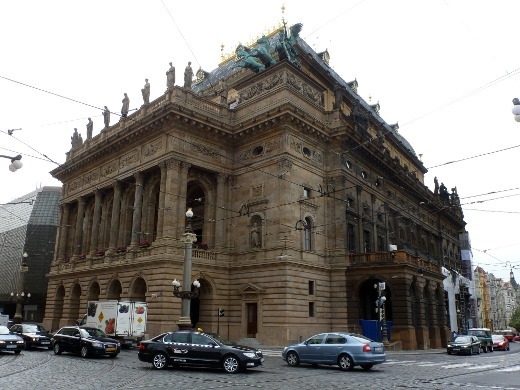 We walked along the embankment until we found the National Theater. It was difficult to get a nice shot of this marvelous neo-Renaissance building, but it’s most prominent feature is it’s blue and gold rooftop. 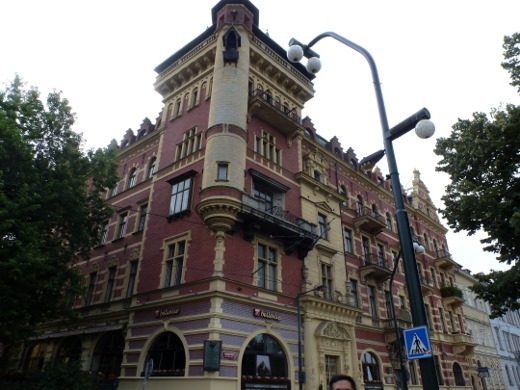 We continued our mosey down the avenue Národní until we reached Wenceslas Square. 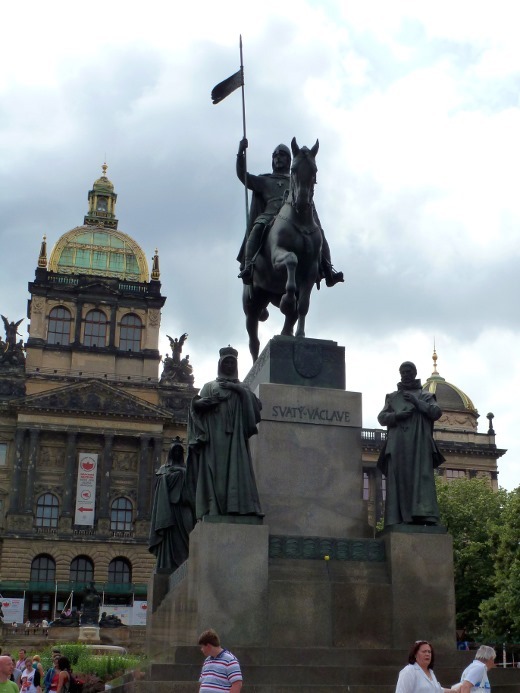 This square is the most famous in the city, and has a rich history dating back many, many centuries. 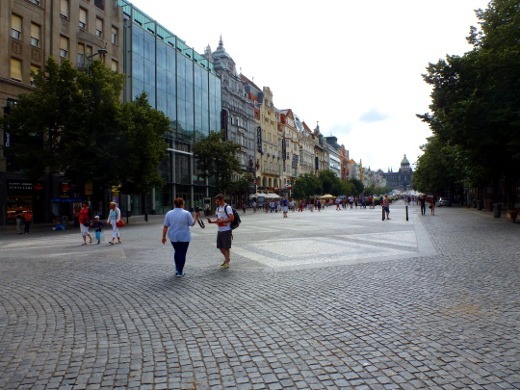 Each historical milestone Prague has seen over the past few centuries has resulted in crowds gathering in this square. 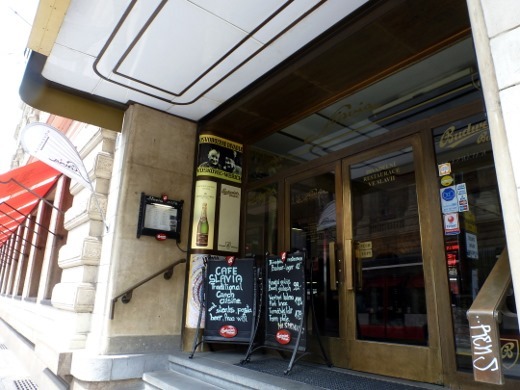 The most popular meeting spot in the city, I’ve been told, is “at the horse,” which means at the Statue of St. Wenceslas in Wenceslas Square. As it turns out, the above National Museum building has been, and is, closed for reconstruction for the past two years, so instead we visited the adjacent building which also houses part of the National Museum collection. 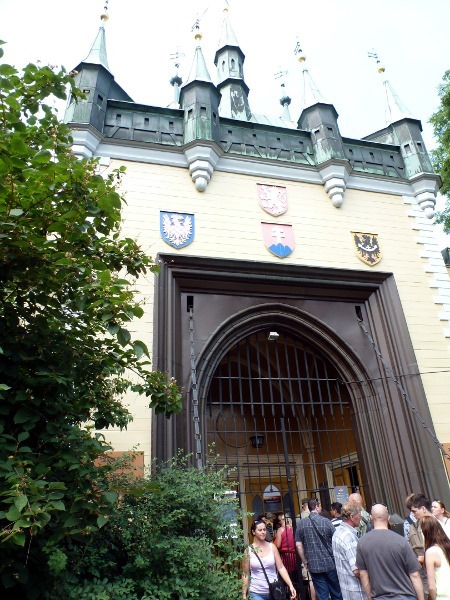 Unfortunately pictures were not allowed, but we viewed several different exhibitions. 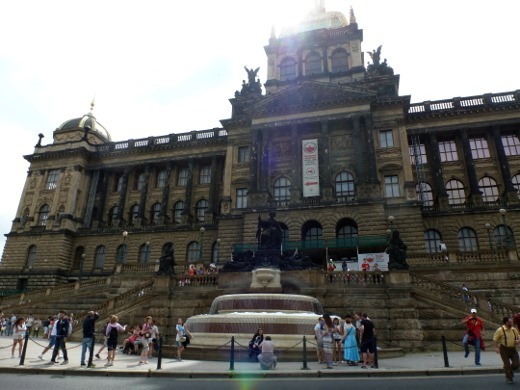 The museum was interesting, but I feel there are more exciting things to see in the city, so I wouldn’t prioritize this item if you are building a Prague itinerary. 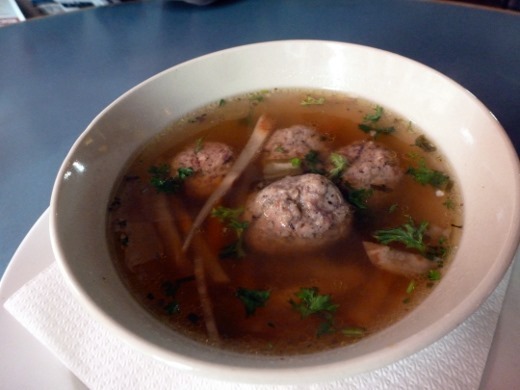 I ordered a pasta salad with featuring a really fun hearty bite-size pasta shape, served with parsley, arugula (bleh – why!? 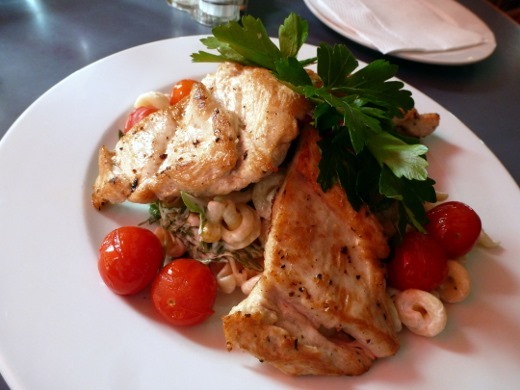 ), bursting warm cherry tomatoes, huge briny Czech capers, and turkey cutlets. 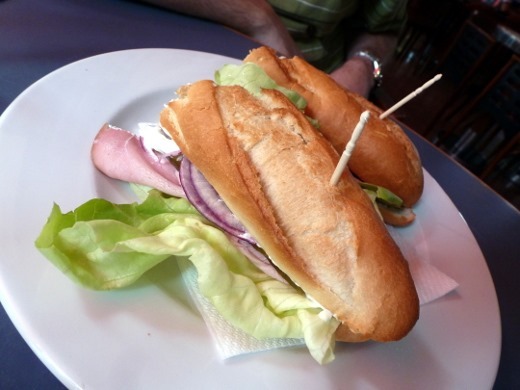 And a ham sandwich. Much ham was consumed during our Prague trip! The Czechs are known for it. 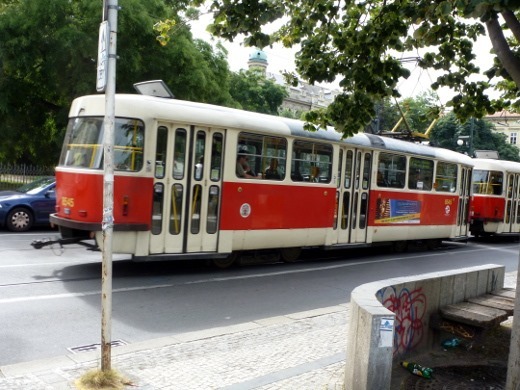 After lunch, we departed from our itinerary, and spontaneously marched over to “the other side of the river,” via most Legii (also known as “the bridge under the Charles Bridge”), and rode the Funicular Railway up Petrin Hill. 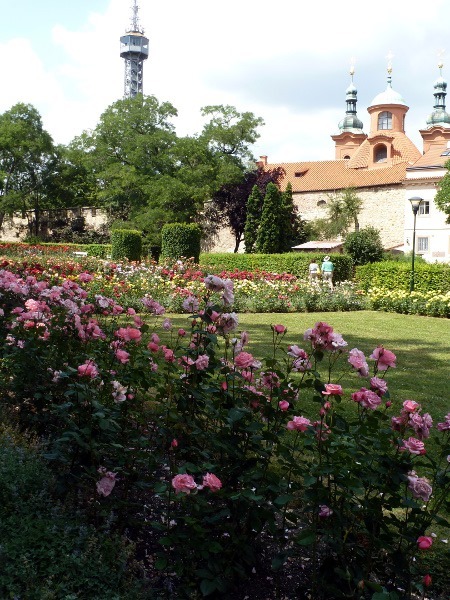 I don’t think you could pay me to walk up Petrin Hill. (Though I did walk DOWN it one day toward the end of our trip. It’s pretty steep. 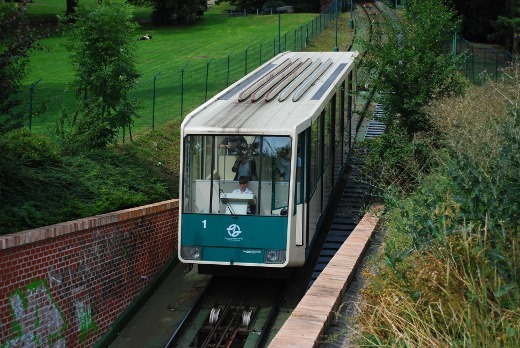 I’ll stick to the funicular. 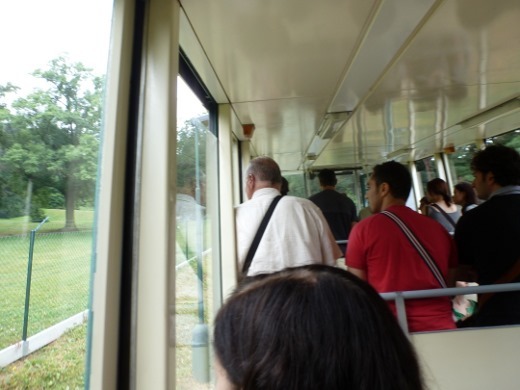 I put the FUN in FUNicular! On the way up the hill, we saw lots of grass loungers, sun bathers, book readers, wine-drinking picnickers, hikers, and the like. 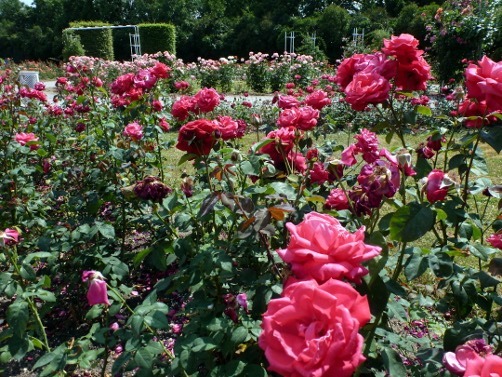 Upon exciting the funicular, we found the lovely rose garden. 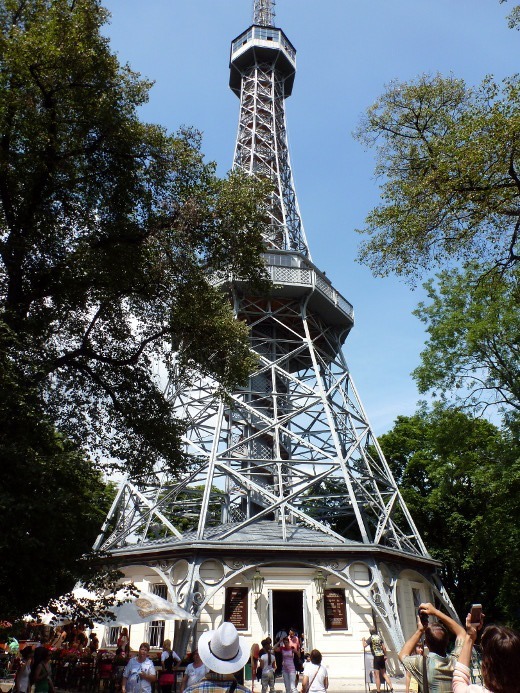 We walked over to the Petrin Observation Tower, to check it out. We would climb it another day. Mmm, this is nice and all, but I’ll take the Paris version (which brought tears to my eyes. #emotional). 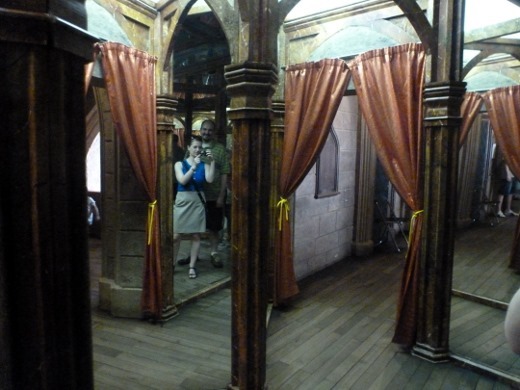 Not far from the Observation Tower is the Maze of Mirrors, which we did decide to check out! First you walk through this trippy, well, maze of mirrors. 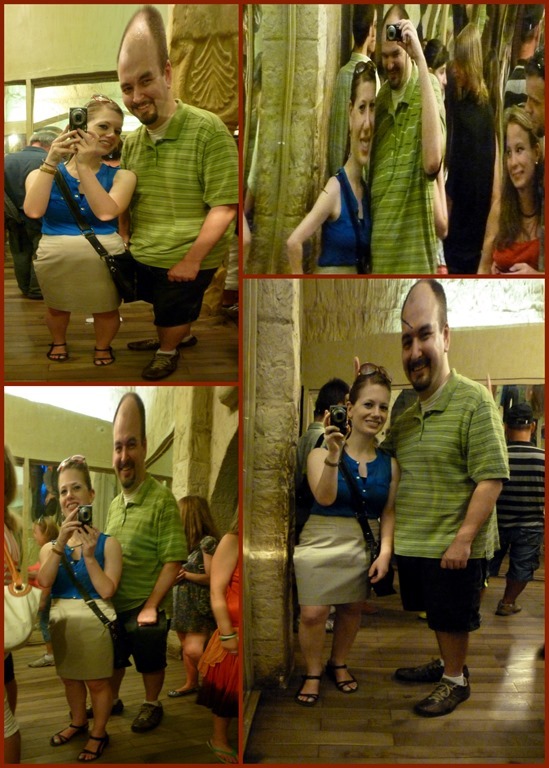 But the real fun lies in this crazy mirrored room containing a plethora of crazy convex and concave mirrors that will leave you laughing hysterically. 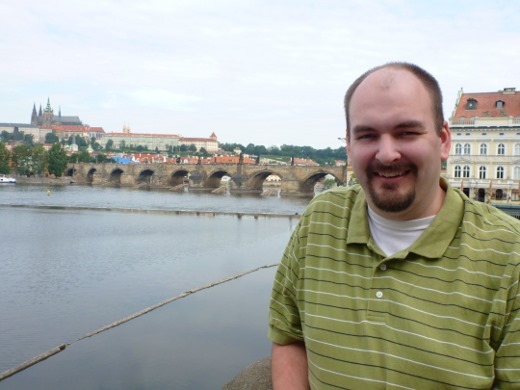 I’ll be back soon to tell more about the second half of our first full day in Prague. Spoiler Alert: it involves TONS OF FOOD!!!!! !